When we have the chance to hear soprano Christine Brewer sing, we take it. We have reviewed her recitals in Washington, in 2010 and 2005, and on stage whenever possible. Naturally, Ionarts was in the Kennedy Center Terrace Theater on Wednesday night, to hear Brewer's latest program, When I Have Sung My Songs to You, presented by Vocal Arts D.C. This concert was that most prized combination in the rarefied world of the Lieder recital: a rather brilliant selection of almost unknown pieces, all by American composers, sung by one of the best singers, possibly my favorite living singer (and also just a very down-to-earth person), who was performing near the top of her game. 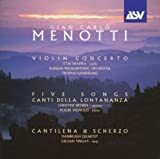 The first half opened with a cycle of songs by Gian Carlo Menotti, Canti della lontananza, a setting of his own Italian poetry. The seven poems are a sort of emotional catalogue, presumably autobiographical, of depression and anxiety over love lost, the eponymous "absence" (lontananza) of the beloved, in middle age. The cycle was commissioned by Elizabeth Schwarzkopf and there is a live video of two of the songs, made by Schwarzkopf in Brussels in the 1960s, a few years after the cycle was composed. Brewer herself made a recording of the work, with pianist Roger Vignoles, from a few years ago, a comparison that is telling as far as the demands Menotti made on the singer here. The time having passed since Brewer's recording showed in a number of mistakes she made with the words, although she performed from the score. This is an admittedly minor concern, since the musical line and substance were all there, and if one was not following the texts in the program or fluent in Italian, it is unlikely one would even have noticed. 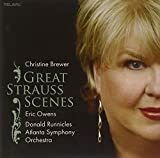 The songs featured the various strengths of Brewer's exquisite soprano, its puissant heights reaching up to a terrified howl at points, oak-strong chest voice, and its velvety piano. Menotti's style ranged from misty harmonies reminiscent of Debussy, almost pointillistic, 12-tonish dissonance, and even hints of blues. Rutenberg is an accomplished accompanist, something that requires a keen musical and cooperative sense, but a set of piano pieces by Virgil Thomson revealed that, while certainly able and consummately sensitive, he is not a blistering technical force at the keyboard. This set of five works, all musical portraits of Thomson's friends and acquaintances (including one of Carrie Stettheimer, who created this incredible doll house, now in the City Museum of New York, complete with tiny reproductions of modern art made by the artists themselves for Carrie), had the same sort of harmonic oddness and melodic whimsy associated with the programmatic music of Erik Satie. (Rutenberg reported, in one of several charming anecdotes about Thomson, that he is working on a recording of all of the composer's piano music.) 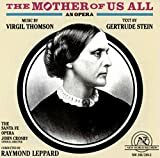 This little set was a fine introduction to Brewer's grand interpretation of Susan B. Anthony's final aria from Thomson's The Mother of Us All, the composer's final collaboration with Gertrude Stein. At this point in the opera, a statue of Anthony is placed in the U.S. Capitol: after the unveiling ceremony, the statue sings, animated by Anthony's ghost. Echoes of an old revival hymn help create a sense of eternity. An Ives set continued the spirit of lightness from the first half, prompting more fun anecdotes from both Brewer and Rutenberg. Something about Ives -- the popular song quotations, the crazy metric shifts, the jokey atmosphere -- can catch performers off-guard: there was a similar easiness of tone when Thomas Hampson performed some Ives songs a few years ago at the Library of Congress. There were serious, elegiac moments (gorgeous renditions of At the River, with its odd harmonic wanderings and open-ended questioning of faith, and of Rather Sad) and many broadly comedic ones, not least the starting over of the hilarious We're sitting in the opera house (from Memories) because of trouble with the whistling part. (A surprise, since Brewer proved she had a great wolf-whistle in Britten's Cabaret Songs at her 2005 recital.) There was one technical issue in Brewer's voice, most prominently heard in this song, too -- an uncomfortable miscalculation when transitioning between chest and upper voices. It was a rare reminder that she is human after all. 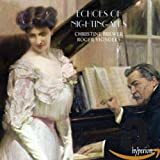 At all three of Brewer's recitals we have reviewed, including this one, she has ended with a most intriguing set of songs she has taken to calling Echoes of Nightingales. Her latest CD, with the same title, draws together many of these songs, all of which are taken from the recital programs of great divas of the past (Helen Traubel, Kirsten Flagstad, Eleanor Steber, Eileen Farrell), found in printed programs given to Brewer by a voice teacher. These songs, mostly contemporary pieces programmed as encores, are almost always worth rediscovering. This was once again true of lovely, sometimes charmingly over-sentimental songs like Ernst Charles's When I Have Sung My Songs to You (whence the title of Brewer's recital), A. Walter Kramer's Now, Like a Lantern, and Celius Dougherty's Everyone Sang (on a text by Siegfried Sassoon). That last one, featuring a soaring conclusion up to a thrilling high note, combined with other Dougherty songs chosen by Brewer in previous performances, was a reminder that Dougherty's work should be re-examined by singers everywhere. Encores included another Ives setting (of the spiritual Give Me Jesus) and Lili's pretty little song Mira from Carnival, the latter also heard as an encore at Brewer's 2005 recital. Even with its few flaws and minor mishaps, this recital -- and how rarely does a critic get to write these words -- was a sensation. Vocal Arts D.C. hosts one more recital this season, with tenor Paul Appleby and the remarkable pianist Steven Blier (May 16, 7:30 pm), in the Kennedy Center Terrace Theater.